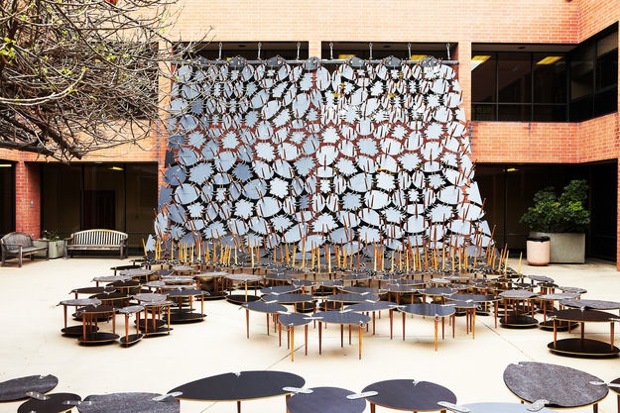 Tables are places we gather to socialize, but in the case of a new installation for a UCLA courtyard, it appears that the tables have gathered to socialize with each other. 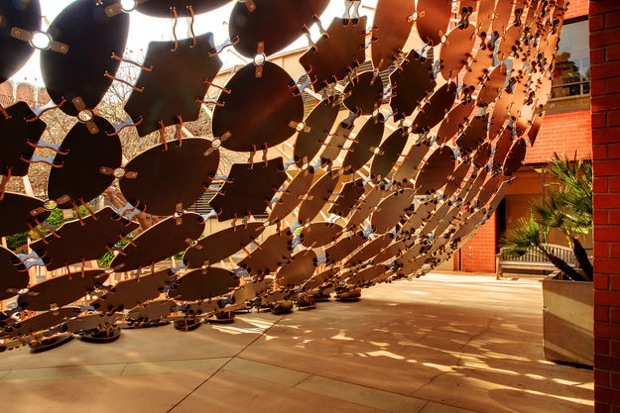 Table Cloth features hundreds of tables dripping down from the second story of the Herb Alpert School of Music at UCLA that are linked together with a series of brackets to create both a seating area for students and a dramatic backdrop for summer concerts. The tabletop-textile was created by architectural alchemists Benjamin Ball and Gaston Nogues with their L.A.-based studio Ball-Nogues, who you’ll remember for Liquid Sky, their shimmery circus-like tents at MoMA’s P.S.1 in 2007, and the glowing, misting coils that made up last year’s Coachella pavilion. stools make up the “fabric” of the piece, which face legs-out while suspended in the air, but are flipped toward the ground at the bottom, meaning the tables that stand squarely on the ground can actually be used for sitting. 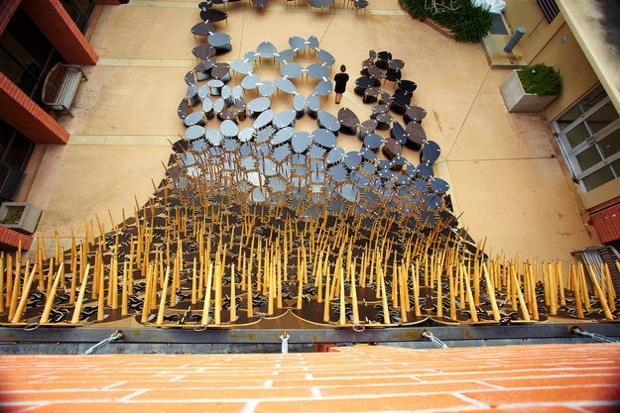 Twenty-five additional free floating stools are found throughout the courtyard, which will also include a removable stage for performances. the installation comes down at the end of the summer.